You can select and play back the recorded still images from an index screen (thumbnail display). Press the button to select the playback mode. Check if the playback mode is . 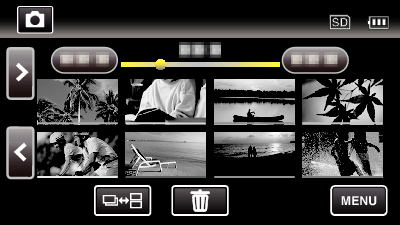 If the mode is video, tap on the playback screen to display the mode switching screen. Tap on the file to start playback. Tap to return to the index screen. appears on the last image played back. Lines in different colors are displayed under the thumbnail display to distinguish the recording date. Switches between video and still image modes. You can perform the same operation with the zoom lever. Switches between the group or full index screen displays. Operations buttons on the touch screen disappear if the unit is not operated for about 5 seconds. Tap on the screen to display the operation buttons again. 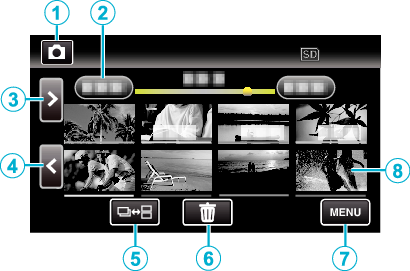 Continuous playback of still images that are recorded with the continuous shooting mode. The same operation can be performed with the adjustment dial. The same operation can be performed with the SET button. Deletes the currently displayed still image. Enlarges the still image that is being played back. 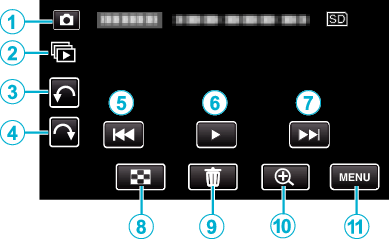 Tap or drag on the operation area of the touch screen. You can rotate a still image 90° to the right or left during playback. Rotation applies to the on-screen display only. You can search for a specific file by the recording date. This is useful when searching from a large number of files. This unit is a microcomputer-controlled device. Electrostatic discharge, external noise and interference (from a TV, a radio, etc.) might prevent it from functioning properly. In such a case, turn off the power, then remove the AC adapter and battery pack. This unit will be reset.